The design for Botanique at Bartley is inspired by nature and botanics. Hence Botanique. The beauty of nature is celebrated in its design. Apart from a 50m lap pool, meandering pools permeate the development, simulating an environment in nature. The buildings are assimilated into this landscape. Rare sky gardens with a variety of plant species rise up the towers, evoking the exhilaration of a forest canopy and doing its bit for fresher air. With its carefully designed resort-like serenity, coming home to Botanique at Bartley will be like coming home to the relaxation of one’s own private retreat. The architectural planning for Botanique at Bartley seeks to overcome the challenges of urban living. The towers are designed to capitalise on the panoramic views, and minimise overlooking so you get privacy even in the midst of high-rise living. The resultant spatial quality feels less dense than other projects with the same 2.8 gross plot ratio. Tower to tower distances span up to 70m, and over 70% of the apartments get views of the pools or lush landscape. The entrance to this idyllic landscape starts with the Hilltop Drive & entrance canopy that overlooks the whole site. Then past the Tranquility Pool & Hilltop Drive, to the 50m lap pool, down to the organic wellness pool with aquatic gym, and the Forest Clubhouse. The undulating terrain is carved into distinct zones, with the main clubhouse as the focal point. Perched over a cascading pool, the clubhouse is reminiscent of Falling Waters, an iconic, timeless architectural masterpiece. The landscape architect is EcoPlan Asia. EcoPlan itself is an international Land Planning and Landscape Architectural firm specializing in the planning and design of resort, residential and commercial developments worldwide. 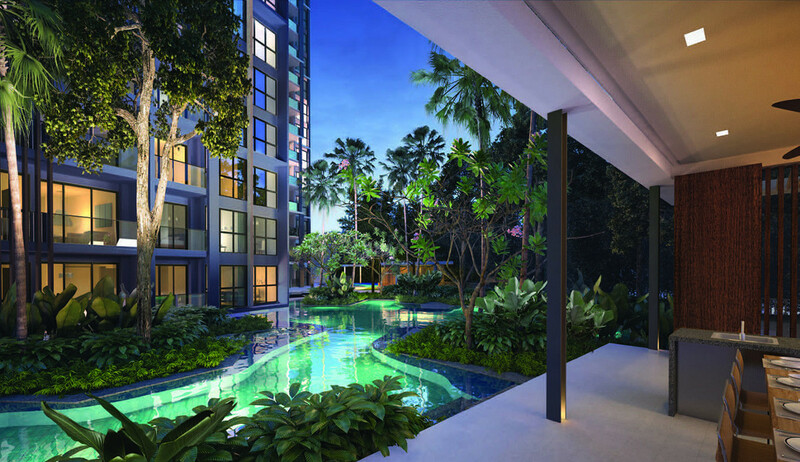 This entry was posted in Botanique at Bartley | Botanique @ Bartley and tagged bartley condo, bartley new condo, botanique at bartley, botanique at bartley uol, botanique bartley singapore on October 28, 2014 by Reviewer.